In addition, Earth’s magnetic field is affected by other factors, such as magnetized rocks in the crust and the flow of the ocean. For this reason, the European Space Agency’s (ESA) Swarm satellites, which have been continually monitoring Earth’s magnetic field since its deployment, recently began monitoring Earth’s oceans – the first results of which were presented at this year’s European Geosciences Union meeting in Vienna, Austria. The Swarm mission, which consists of three Earth-observation satellites, was launched in 2013 for the sake of providing high-precision and high-resolution measurements of Earth’s magnetic field. The purpose of this mission is not only to determine how Earth’s magnetic field is generated and changing, but also to allow us to learn more about Earth’s composition and interior processes. Beyond this, another aim of the mission is to increase our knowledge of atmospheric processes and ocean circulation patterns that affect climate and weather. The ocean is also an important subject of study to the Swarm mission because of the small ways in which it contributes to Earth’s magnetic field. Basically, as the ocean’s salty water flows through Earth’s magnetic field, it generates an electric current that induces a magnetic signal. Because this field is so small, it is extremely difficult to measure. However, the Swarm mission has managed to do just that in remarkable detail. These results, which were presented at the EGU 2018 meeting, were turned into an animation (shown below), which shows how the tidal magnetic signal changes over a 24 hour period. By learning more about Earth’s magnetic field, scientists will able to learn more about Earth’s internal processes, which are essential to life as we know it. This, in turn, will allow us to learn more about the kinds of geological processes that have shaped other planets, as well as determining what other planets could be capable of supporting life. Be sure to check out this comic that explains how the Swarm mission works, courtesy of the ESA. Although invisible to the eye, Earth’s magnetic field plays a huge role in both keeping us safe from the ever-present solar and cosmic winds while making possible the opportunity to witness incredible displays of the northern lights. Like a giant bar magnet, if you could sprinkle iron filings around the entire Earth, the particles would align to reveal the nested arcs of our magnetic domain. The same field makes your compass needle align north to south. We can picture our magnetic domain as a huge bubble, protecting us from cosmic radiation and electrically charged atomic particles that bombard Earth in solar winds. Satellites and instruments on the ground keep a constant watch over this bubble of magnetic energy surrounding our planet. For good reason: it’s always changing. The European Space Agency’s Swarm satellite trio, launched at the end of 2013, has been busy measuring and untangling the different magnetic signals from Earth’s core, mantle, crust, oceans, ionosphere (upper atmosphere where the aurora occurs) and magnetosphere, the name given to the region of space dominated by Earth’s magnetic field. At this week’s Living Planet Symposium in Prague, Czech Republic, new results from the constellation of Swarm satellites show where our protective field is weakening and strengthening, and how fast these changes are taking place. Based on results from ESA’s Swarm mission, the animation shows how the strength of Earth’s magnetic field has changed between 1999 and mid-2016. Blue depicts where the field is weak and red shows regions where the field is strong. The field has weakened by about 3.5% at high latitudes over North America, while it has grown about 2% stronger over Asia. Watch also the migration of the north geomagnetic pole (white dot). Between 1999 and May 2016 the changes are obvious. In the image above, blue depicts where the field is weak and red shows regions where it is strong. As well as recent data from the Swarm constellation, information from the CHAMP and Ørsted satellites were also used to create the map. The animation shows changes in the rate at which Earth’s magnetic field strengthened and weakened between 2000 and 2015. Regions where changes in the field have slowed are shown in blue while red shows where changes sped up. For example, in 2015 changes in the field have slowed near South Africa but changes got faster over Asia. This map has been compiled using data from ESA’s Swarm mission. The animation show that overall the field has weakened by about 3.5% at high latitudes over North America, while it has strengthened about 2% over Asia. The region where the field is at its weakest – the South Atlantic Anomaly – has moved steadily westward and weakened further by about 2%. Moreover, the magnetic north pole is also on the move east, towards Asia. Unlike the north and south geographic poles, the magnetic poles wander in an erratic way, obeying the movement of sloshing liquid iron and nickel in Earth’s outer core. More on that in a minute. The anomaly is a region over above South America, about 125-186 miles (200 – 300 kilometers) off the coast of Brazil, and extending over much of South America, where the inner Van Allen radiation belt dips just 125-500 miles (200 – 800 kilometers) above the Earth’s surface. Satellites passing through the anomaly experience extra-strong doses of radiation from fast-moving, charged particles. The magnetic field is thought to be produced largely by an ocean of molten, swirling liquid iron that makes up our planet’s outer core, 1,860 miles (3000 kilometers) under our feet. As the fluid churns inside the rotating Earth, it acts like a bicycle dynamo or steam turbine. Flowing material within the outer core generates electrical currents and a continuously changing electromagnetic field. It’s thought that changes in our planet’s magnetic field are related to the speed and direction of the flow of liquid iron and nickel in the outer core. Further results are expected to yield a better understanding as why the field is weakening in some places, and globally. 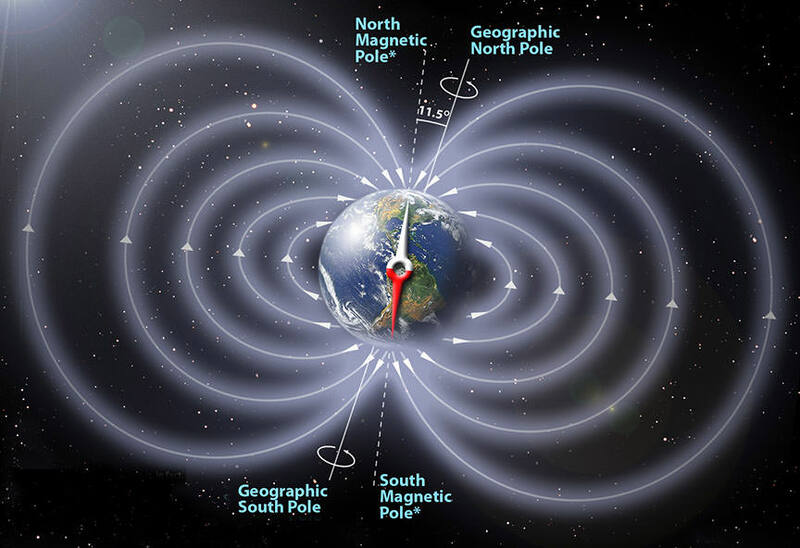 We know that over millions of years, magnetic poles can actually flip with north becoming south and south north. It’s possible that the current speed up in the weakening of the global field might mean it’s ready to flip. Although there’s no evidence previous flips affected life in a negative way, one thing’s for sure. If you wake up one morning and find your compass needle points south instead of north, it’s happened.